Bazaar in Turkmenbashi, Turkmenistan. Photo by Peretz Partensky. The cool, sweet flesh would fill your belly and spirit. Eating it would definitely make you smile. 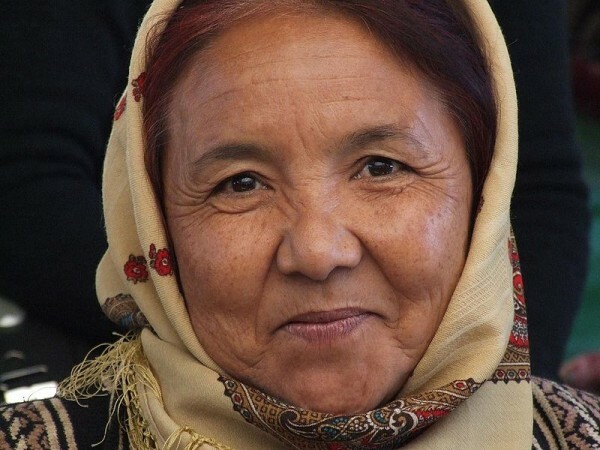 Turkmen woman. Photo by yaluker. And spreading it on bread? If any of this appeals to you, you might want to consider moving to Turkmenistan. These lovely people have celebrated Melon Day since 1994, and they don’t plan to stop eating the sweetness anytime soon. When I read in The World Cookbook for Students that Watermelon Jam is a thing in Turkmenistan (particularly when served on toast with tea), I knew we had to try it. I made a nice batch of jam from half a regular watermelon. What a great gift to share with friends and family! There’s a lot of science in jam making, but don’t let your grocers limitations keep you from trying this recipe. It’s basically boil-and-go. Sterilize your jars either by boiling them in a pot on the stove or running them through the sterilize cycle of your dishwasher. Do a little dance while they get cleaned. Leave them in the pot or dishwasher until needed, so they stay as clean as possible. Next, stir the pectin powder into the sugar. This will keep it from clumping when you add it to the liquid. If you’re using Pamona’s, also make the calcium and water mixture. Set both mixtures aside. We’re going to puree the watermelon. You have three options for this. a) If you have an immersion blender, scoop about half the flesh of a medium watermelon into a large bowl. Pulse away, then scoop out any of those little white seeds that may remain. Measure and make sure you have 8 cups. b) If you have a regular blender, blend in batches. Again, scoop out any of the little white seeds and measure. c) Mash it by hand. Remove seeds and measure. 3. 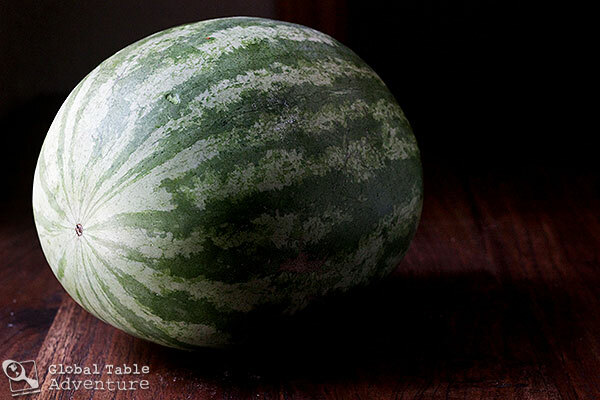 Next, add the watermelon, lemon juice, and calcium mixture to a wide, deep pot. Bring to a boil. Stir occasionally. Add in the sugar mixture, stir, and boil for about 2 minutes. NOTE: Keep a close eye on the pot; temperatures can take a while to heat up, but then can change very quickly. Also, the watermelon will foam somewhat. Stirring will help keep that at bay. 4. 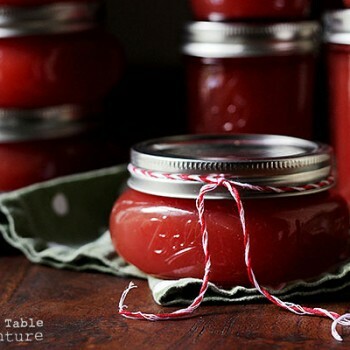 Ladle watermelon jam into sterile jars and seal with lids. 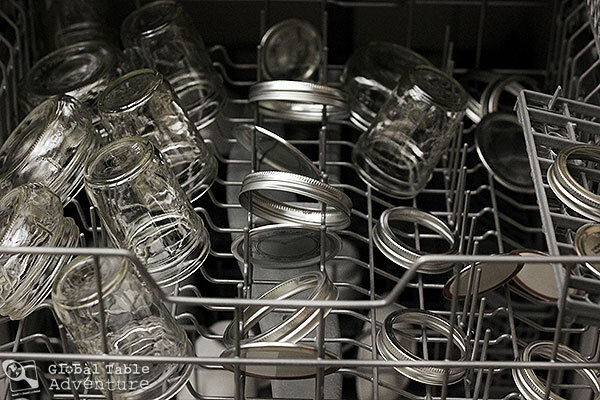 The jars should still be warm from the dishwasher; this will help prevent cracking. OPTION A) Place sealed jars into clean pots. Completely cover with boiling water (an inch above the tallest jar is best). Boil about 10 minutes. TIP: For this method, I found it easiest and safest to place the pot on the stove, then use a pitcher to fill it with boiling water. No need to carry a heavy, sloshing pot across the kitchen. OPTION B) Fill the pot with water, bring to a boil, then add the filled, sealed jars of jam. Make sure they are submerged, then boil 10 minutes. This is the traditional method. …Perhaps with a dusty, dreamy sort of view. 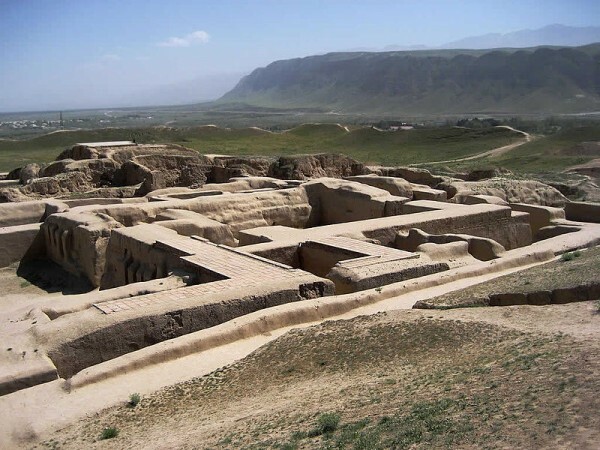 The remains of the fortress of Nisa, an ancient parthian capital, now in Turkmenistan. Photo by David Stanley. Please Note: This jam will be runny until refrigerated. *Numbers from Turkmenistan by Paul Brummel. 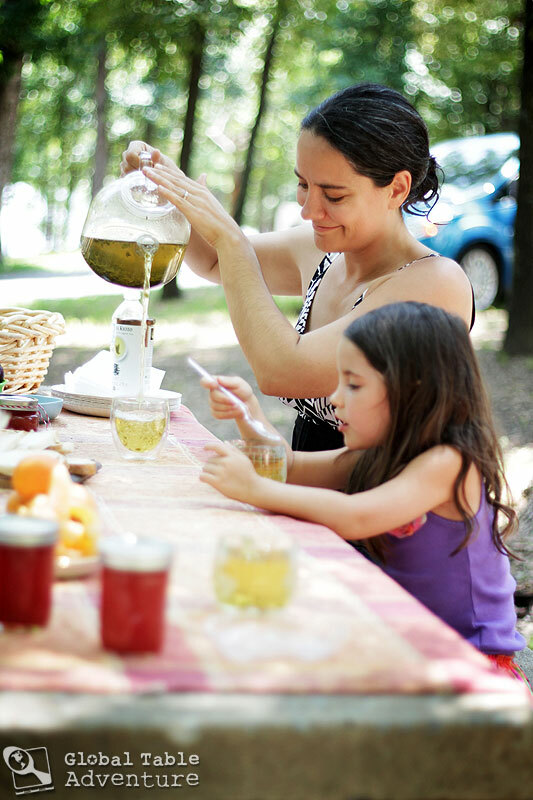 Have you ever made jam or jelly? What do you think of the process? Does it seem doable? While I’ve made chutney before, this was my first time to make a real jam. I made a nice batch of jam from half a regular watermelon. Tastes like jarred sunshine. What a great gift to share with friends and family! Perhaps with a spot of tea. First things first: Sterilize your jars either by boiling them in a pot on the stove or running them through the sterilize cycle of your dishwasher. Leave them in the pot or dishwasher until needed, so they stay as clean as possible. We’re going to puree the watermelon. You have three options for this. a) If you have an immersion blender, scoop about half the flesh of a medium watermelon into a large bowl. Pulse away, then scoop out any of those little white seeds that may remain. Measure and make sure you have 8 cups. b) If you have a regular blender, blend in batches. Again, scoop out any of the little white seeds and measure. c) Mash it by hand. Remove seeds and measure. Next, add the watermelon, lemon juice, and calcium mixture to a wide, deep pot. Bring to a boil. Stir occasionally. Add in the sugar mixture, stir, and boil for about 2 minutes. NOTE: Keep a close eye on the pot; temperatures can take a while to heat up, but then can change very quickly. Also, the watermelon will foam somewhat. Stirring will help keep that at bay. Yes, I have TRIED to make jam, well jelly, before. It stayed runny. I used wild chokecherries picked locally. Be aware jellies and jams that do not thicken make great syrup. You can just think, “I meant to do that.” Of course, then you need to have pancakes (or ice cream) for tea! Thanks for the twist on jam–never had watermelon before. Did you refrigerate it? This will stay runny, too, until refrigerated. As for the syrup: great tip! Watermelon would be really interesting on crepes! i really really want to make it..but i do i/must i/ need calcium powder? what does it add to the jam? Thank you Sasha. I can’t get over the cuteness of the jar itself(is it bad that its propelling me to make a jam? )Ok.so it means if i am not using Pomona and regular supermarket pectin,i am using more sugar to make it set right?I would prefer less sugar though. What do you use if not using Pomona’s pectin or calcium powder? I too have never heard of adding Pomona calcium powder to these recipies….nor have I heard of Pomona universal pectin powder in measurements. Here in Grande Prairie, AB…they sell us Certo, and Pectin only. You can buy each in pre-measured form, but not in a boxed form in which you could remove your own powdered form . Could you please let me know where I could purchase these two products and what the purpose is of these products. 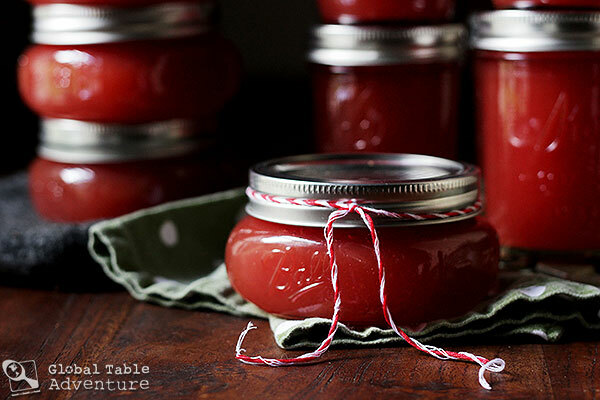 I have made strawberry jam – once – and was shocked by how much sugar was required. 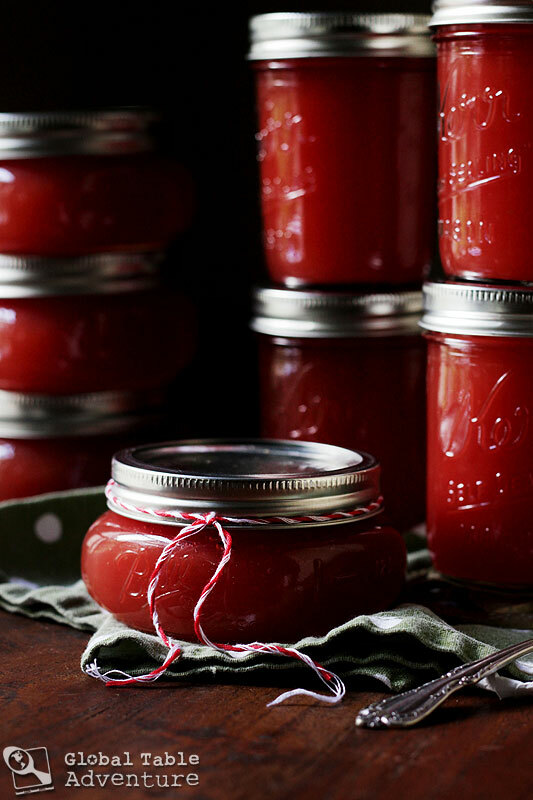 Watermelon is almost my favorite food, so I’m sure to try your jam recipe – with the Pomona pectin. It should be wonderful to distribute at Christmas. Yes! What a fun idea – bring them sunshine in the heart of winter. Love it. Hi Sasha, I enjoyed reading your post — nicely done and nicely written. I have one tip for you in regard to the water bath processing. Ideally, you would have the water in the water bath canner already boiling at the time you are filling the jars with the jam. What we do is fill a jar (outside of the canner), put the lid on, and set it aside until all the jars are ready. Then we add them all together to the boiling water in the canner. As soon as the water gets back to a rolling boil, set the timer for the proper processing time. The reason for this is that if the pectin is exposed to heat for too long, it will break down and won’t be able to jell the jam. 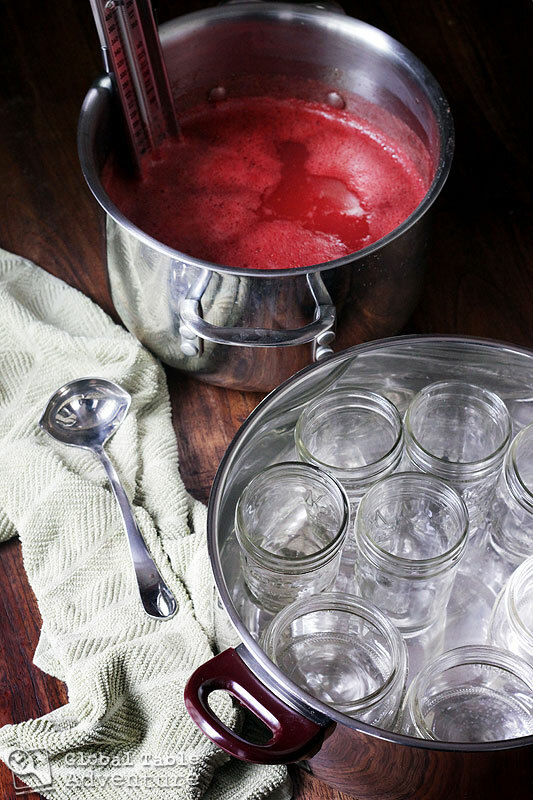 For cooked jam, it should be jelled when the jars are completely cool — 12 to 24 hours. Normally cooked jam doesn’t require refrigeration in order to jell. If you have any questions about Pomona’s or processing, please don’t hesitate to give us a call or send an email. Mary Lou – so nice to hear from you! I didn’t realize the water had to already at a boil when the jars are added. Do you think it would be fine if I did it as above, but boiling water was added to the pots instead of room temperature? Or is that making it more complicated than it has to be? I’m guessing the reason you want to fill the jars in the pot and add water is because you don’t have a jar lifter? I’m not sure why you would do it that way otherwise . . .? The issue is getting the water in the pot back to a rolling boil quickly so that the pectin doesn’t cook for too long in the jars. You don’t want to expose the pectin to hot temperature more than 15 to 20 minutes max. Jar lifters are a great help in canning! This is a great recipe for making watermelon jam. I can’t wait to try it. However, I recently made a batch of strawberry, peach and red plum jelly. My shelves are nice and full. I make jelly all the time, but I’ve never placed my filled jars in a hot water bath after they’re sealed. It isn’t necessary. Just fill the jar, seal, and set aside. Let the jars set overnight. By morning, the jelly will have set just fine without the hot bath. Of course, this depends on your following the recipe and using the correct amount of sugar to ensure the jelly sets. This is how my mom made jam too–without the boiling water bath. When I started making jam (I have a lot on my shelves also), what I learned is that it might “work” to do this, but it’s not considered safe according to USDA guidelines. I don’t want to mess with getting (or giving) food poisoning from my jam! love the idea of watermelon jam, thank you. there is a wonderful canning resourxe everyone needs to check out! national center for home food preservation. there are other good alternatives for low sugar jam. suggest water bath be at about 180 degrees when you put in jars, then bring to boil and start timing. this decreases broken jars. I used 4 cups of watermelon and 1 quart of strawberries and made the most delicious jam I have ever had in my life..ii thickened great with 1 package of pectin and 6 cups of sugar. Grandkids love it! Sounds great! Did you use any lemon juice? Could you share this recipe please. 1 point about canning, if you are not using a canning pot for the jars you should have a tea towel, cake rack or even just a layer or loose rings lining the bottom of the pot. This keeps the jars slightly away from direct heat, and means the jars are less likely to crack while being processed. If I were to use large quantities of this at once and didn’t need to preserve them and go through the canning process… How long would this last refrigerated? Hi Peggy – I would say a week for certain… beyond that I couldn’t guarantee. What is calcium water and where do you get it.? And do you have to have it. If you don’t use it what will happen?. I have never heard of it. Nancy, the calcium water comes in the Pomona’s package. It’s a low sugar mix – if you were going to make a sweeter recipe you could use a different ratio of gelatin etc. Gelatin is not used. Pectin is a natural plant fiber; gelatin is an animal product and not appropriate to use in boiling water processed products. Any idea how this would turn out making it by the freezer jam method? Don’t know on the freezer jam, but I’m gonna try it. 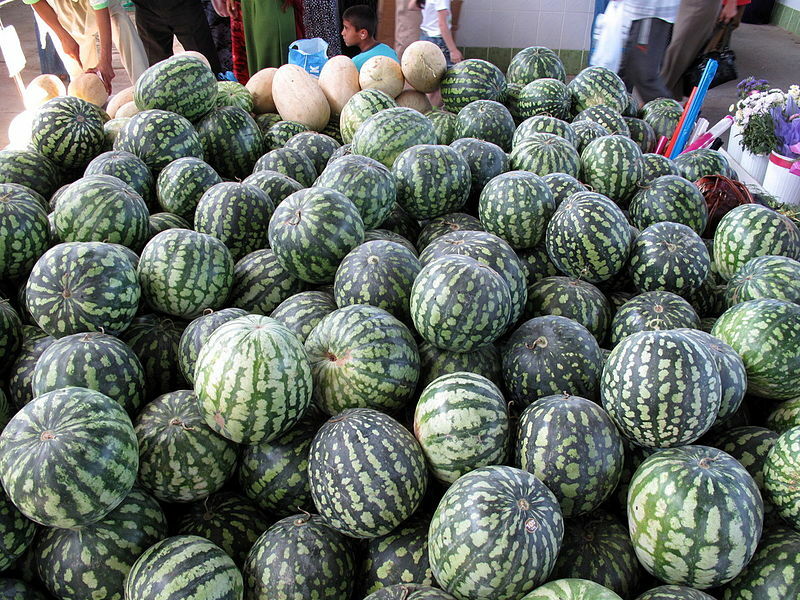 Watermelons are getting cheaper. Also gonna try making some jelly, they are mostly water anyway. 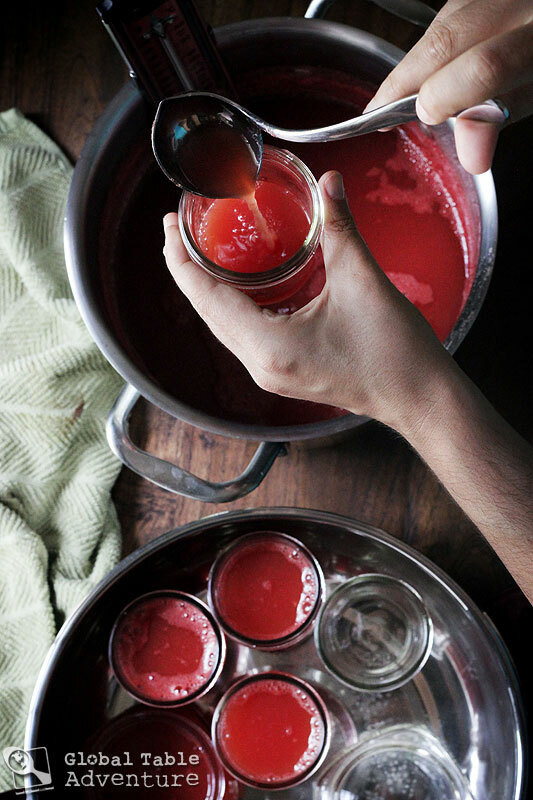 As I am reading this article on making watermelon jam, I am smiling, it just makes me happy. Thank you. My mom use to make a cantaloup jam, tasted like butterscotch, will try to find her recipe. Wow – what an interesting idea! Is it possible to make frozen watermelon jam? I make a frozen strawberry jam? I made this last summer, and was very disappointed. 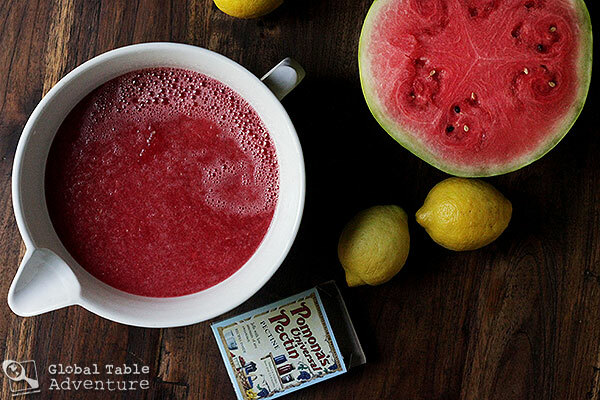 The lemon juice over powered the watermelon and ruined the flavor. Is the point of lemon juice ascorbic acid? If so can I crush up a vitamin C tablet and add that? Sorry to hear that! 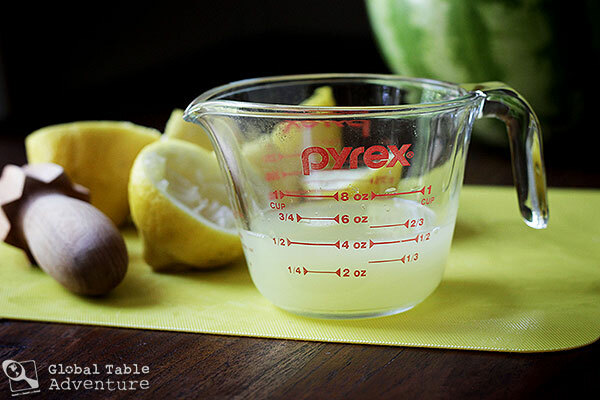 Lemon juice is added because watermelon is a low acid fruit. You generally want 1 Tablespoon lemon juice per 1 cup of fruit. I don’t find it super strong, but perhaps my watermelon was sweeter and covered it up more? Anyway, to lower to the lemon flavor you’d have to experiment – I’m not sure what the tablet would do to the mix. Is there a way to eliminate the sugar or use a substitute? What are the substitutes and amounts? Just finished making my first batch and completing my first canning session! Yeah! The jars are cooling. I wanted to use the whole watermelon so I had to adjust the recipe for 15 cups of puree. I also had just let my daughter borrow my lemon juice so I had to use lime instead. I tastes really good from the pan!! We will see what happens. I had some left over so I put it in containers for freezer jelly. I’ll let you know how it comes out. Thank you for helping me get started on a great adventure! I’m new to canning but we just made a ton of freezer strawberry jam. Could this jam be frozen instead? I made this jam resently using another recipe, which the first time it didn’t come out. So I researched and found your recipe. I used regular pectin 2 boxes of powder pectin and 4 cups of sugar, and the 1/2 cup of lemon juice. It came out perfect. Thank you so much for sharing your recipe.